For example, I have sci-fi set from Rendorisity by a vendor called 3-d-c or pgmer01. It's an apartment. I select each wall, the floors and the ceiling along with a pillow and blanket. Only the pillow, blanket, and a wall with windows will show in renders and in the preview pane. The other objects are in the scene tab but have nothing listed at all in the surfaces tab. I thought at first that this may be something with this product, maybe something had gotten corrupted but it has happened with other stuff and not just poser-style CR2s. For example one of my Genesis wardrobe items which uses dsf files won't load. One shirt will load, everything else doesn't show with the same symptoms. They appear in the scene tab but there is nothing in the surfaces tab. As a test I loaded up the sci-fi apartment in Daz 3 which I still keep around because I use it for some renders using stuff that never got updated to version 4. The apartment files load up just fine which means it is not an issue with the product, it is an issue with version 4.5. It happens both with content I "migrate from the old database" and content installed directly into Daz4 and pulled out of my smart content tab. I have 2 different scifi apartments from 3-d-c and both load okay for me in Daz Studio 4.5 (I have 64 bit windows version). If selected I see all the material regions in the shader tab. The only problem I had was for the bigger apt. the blanket and pillow did not land on the bed when loaded even when the bed was selected but they are visible as is everything else... I did a couple renders and everything in the scene was rendered okay. I even saved and reloaded the scene and still no problems like you describe. Not sure if you loaded a previously saved scene from DS3..... I loaded the parts from the content library... maybe that is the difference. I thought most issues relating to group naming had been fixed after the early builds of DS4, but I suspect that's the root of the problem - I modified one of their sets and the OBJ file group names had a lot of "construction" grouping left behind, which DS4 doesn't really like. I would bug-report this - as I said, changes were made early on to address it and for the most part they work, but it sounds as if they aren't coping here (assuming my diagnosis is correct). I'm doing it from the content library like you and it isn't working. Since it works for Mr Poser I am wondering if I may have a bad install of 4.5 and should look into reinstalling it? I looked in my log files and didn't see any errors or anything. Hope you find the bug.... it does get nerve wracking. If you want me to post anything let me know exactly which product you are using... I have alot of 3-d-c content. I like the bigger sci-fi azonica series apartment ... the one with all the M4,V4, and S4 poses. Hey, the one I am having issues with is listed as 3-d-c SciFi Apartment in my content library. It is no longer on Renderotica it appears. It's a one room apartment, very small. Here is a link from his website with pics of the apartment and such. I am also having a problem with Way of the Samarii by Luthbel. Only the ronin shirt, the hat, the swords, and the rope belt will work correctly. Yes I have that one (from Renderosity). Here is a render in Daz Studio 4.5. Thank you. At least now I know that the product is not unusuable in 4.5. Rather, my system has some kind of bug. I'm just finishing up a reinstall now but don't hold out much hope. Here is a screenshot of the problem in action. I put on the ronin shirt and the vest and pants from way of the samarii. Only the shirt shows and when I select the other clothing pieces there is nothing in the surfaces tab. Reset Way of the Samurai - that was one my FixDuplicate IDs script wouldn't help with. Edit: It only works on DSF files I guess so it won't touch the cr2s from the sci-fi set. Still, this is both annoying and puzzling. I know it's happened with at least one other product but I neglected to remember the name of it. So, I know of at least these 2. I'm half tempted to downgrade back to 4.0.x just so I can use all my content again. The original released version of Way of the Samurai had some empty geometry names, which is why my script failed. They worked in 4.0 but not in 4.5 - as i said, the product has been updated and if you reset your order the new version will work. Well if that fixes way of the samarii that would be awesome but what about, for example, that sci-fi set? Is there something I could use a text editor to look for and manually fix the CR2s? As an experiment I found the object files and imported them directly. On the plus side, they had settings in the surface tabs. On the down side, they still don't show up though I did notice I could make their bones visible. I also tried changing the scale to see if something odd had happened and they were just very tiny and thus 'invisible'. Taking it all the way to 20000% still showed nothing so that wasn't it. I found another item that won't load. Mr Hyde's pants. They appear in the scene tab but not in the surfaces tab. This is getting really, really problematic. I tried Mr Hyde and I finally got your same problem........... so its not your setup.... like you said the pants did not appear and no shader materials even though its listed on the scene panel. Okay what I did was reset Mr. Hyde and downloaded the new installer. Then I found my old installer and re-installed it so I could create an uninstaller ( I never created them originally). Then I uninstalled the old version of Mr. Hyde and his metadata. Then I installed the new version of Mr. Hyde and his metadata.... and walla the pants showed up again. Hope this helps... at least you are not the only one experiencing such strange stuff happening. I'm going to try this. When I reinstalled Way of the Samarii I did it by just running the installer again and uninstalling when it prompted me. It sounds like you uninstalled first. I also reset Mr Hyde and his version is 1.3 and the version I have is 1.1. We'll see if that makes a difference. As for the apartment, I still have the zip file. I save all my installers and zip files just in case. Interestingly, the program I use to do fast installs of zips and older Daz installers will actually create uninstallers for the zips so I get to test that out! I'll post again when I have tried it. Well, the method above fixed Mr Hyde but not Way of the Samarii. I'm going to go about manually removing the sci-fi apartment and reinstalling it to see if it gets fixed. Edit 2: However, after reinstalling the apartment I am able to get in the object files by importing as long as I remember to set them to poser scale and not to DS scale. (Poser 1 unit = 8 ft, Daz 1 unit = 1 cm.) However, I should note that last time I imported them in Daz scale, not poser scale. And I figured out the problem and how to fix it for the poser file at least. I could probably do the same for the Way of the Samarii as well. I don't know WHY this fixes it just that it does. In this picture, on the left we have the one wall that would load up correctly. On the right we have the floor which won't load. The difference I can see is that next to most categories the wall that works has a number. For it, 4. The one that doesn't only has a number in some places. The number for the ceiling was 1. So I just added a 1 everywhere the wall had it and walla, it loaded correctly into my scene. I hope Richard pokes his head back in here and gives me a technical explanation for why this works. I suspect the number does something like tell the CR2 which object to use but I'm not sure. I also don't know why 4.5 won't accept this but 4.0 and 3.0 do. Sorry I don't own the Way of the Samurai.... I may get it when Luthbel turn in this PA sale. For the scifi apt. 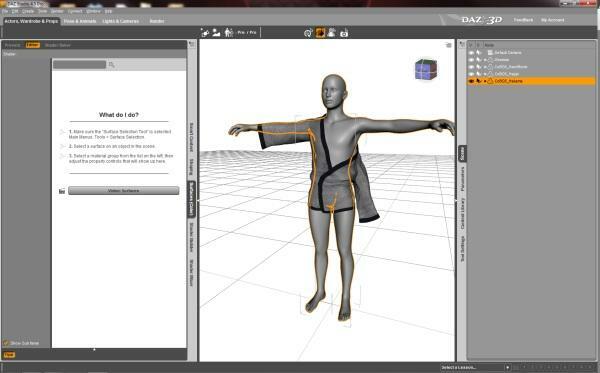 have you tried to install it to a new test runtime and then open in DAZ 4.5... maybe that will load it fresh. It looks like we posted at about the same time. See my post above for what fixes it. It's a pain and I hope I don't discover lots of stuff that doesn't work for this reason. The other thing I found that doesn't work is I have Goredom for the LIE and it doesn't load correctly but that may be a shader for 3.0 so that's probably why. @Riggswolfe have you tried this? Unzip to a temp folder then compare that folder structure to the DS one? At the very least you should see where all the files are so you can remove them. I'm Win7 and have 3-D-C items in 4.5 they all work fine. I just unzip to a temp folder and then drop the Runtime into my My Library Folder and do Merge. They all show in Content Library>Poser Formats>My Library> and load as meant to. OPPS: You beat my post, never mind. Oh you are far braver than I am opening up cr2s..... maybe someday I'll learn more about whats under the hood. I have a program called CR2 editor I picked up once. Back in the day I would sometimes get products that would tell me they were missing textures when they weren't. The issue was that some CR2 had static paths to the textures something like C:/users/BobTheCreator/runtime/textures/product/tex.jpg and since my name wasn't BobTheCreator it would tell me it couldn't find the textures. I could find them manually but in the long run it was better to change the path to the standard relative path that is supposed to be there. I've done that as well. Loads of free items have that problem. I fix it and then save a New Zip for archiving so I can install the fixed item the next time if need be. I have now gotten Way of the Samarii working by editing the DSF files. I did the same thing I did with the CR2, opened one that was working and opened one that wasn't and looked for differences. In the case of Way of the Samarii I had to edit the dsf files in both the data folder and in the figure folder. It was missing some names that told it where to look in the other files for geometry settings. Very similar to the issues with the CR2 screenshots I posted above. I'm not sure why DS3 and DS4.x don't care about this. Maybe they're less picky and 4.5 is more picky to make it more stable or something. "url" : "/data/Luthbel/Way of the Samurai/Hakama/CoBG5_Hakama.dsf#geometry"
"url" : "/data/Luthbel/Way of the Samurai/Hakama/CoBG5_Hakama.dsf#"
Good detective work Riggswolfe! I wonder how widespread the issue is..... I saw a couple of threads where people were listing alot of Genesis content that was updated recently. I think I'll just handle it as I find it. I am waiting for the hinted big news about Poser and Genesis compatibility.... if its major then all these Genesis products will be updated with Poser materials also.... then I'll do a big reset/reinstall project. On good thing I noticed while fiddling with the scifi apartment is how much better the M4 and V4 poses work with Genesis character in 4.5. I found a couple of Luthbel items with blank geometry names, and maybe another item. It's very rare, I suspect that there may have been one version of the Figure setup tool with broken validation. Most of the updates are to fix the Duplicate IDs issue, which doesn't stop content from loading though it's better resolved (with an update or with my script). Yeah, I need to go through and reset a bunch of stuff it's just not something I'm looking forward to since I have a ton of content. Still, I'm glad to know how to fix poser stuff if nothing else. I was able to do a full render of the sci-fi apartment last night after I edited each .CR2. Still, it is interesting that MrPoser has no problems with the same set. I wonder if it is an issue with my Daz or if maybe he bought a corrected version of the poser set in question.